This is my second year guest posting for Eating Rules, and taking the October Unprocessed challenge. I’m loving the timing of this challenge. We’re in that lull before the winter holidays, which means it’s a great opportunity to lighten up and eat whole, nourishing foods that won’t pack on the pounds. We’ll have plenty of time for indulging when Thanksgiving rolls around. For now, it’s all about treating our bodies right… a challenge I am more than happy to participate in! When I eat natural foods that are in tune with my body, I literally feel awesome – like I have an “inner glow.” It almost feels like I’ve spent some time in the gym rather than the kitchen. This Butternut Squash and Chickpea Soup definitely falls into the “inner glow” category. I adapted the soup from an old Israeli family recipe. It includes fresh, wholesome, plant-based ingredients, like spinach for iron and chickpeas (aka garbanzo beans) for protein and fiber. The broth is flavored with a Middle Eastern mixture of spices, including turmeric. Turmeric has strong anti-inflammatory and anti-aging properties; in fact, it’s currently being studied as a cancer-fighting agent. And of course, the star of this recipe is butternut squash… sweet, healthy, vitamin-rich butternut squash. I could make a meal out of the squash alone! Those of you who are familiar with my blogs know that I am fascinated by the story behind the food. On The Shiksa in the Kitchen and The History Kitchen, I explore the roots and origins of the foods we cook. For most recipes I post, I try to give some background on how that recipe came to be. I hope you’ll indulge me while I share a brief history of butternut squash, one of my favorite cold weather veggies. I’m kind of obsessed with this sweet, colorful, amazing winter squash. Butternut squash belongs to a species known as C. moschata., a group of squash that also includes the Winter Crookneck, the Cushawsome, and some varieties of pumpkin. Butternut squash, like all squash, has ancestry in North America. Archaeological evidence suggests that squash may have first been cultivated on the isthmus between North America and South America (known as Mesoamerica) around 10,000 years ago. Squash was one of the three main crops planted by Native Americans, known as the “Three Sisters” – maize (corn), beans, and squash. Winter squash was prized by the Native Americans and settlers in the New World for its long shelf life. It’s a versatile food source that can be easily stored for months, making it invaluable to early American colonizers as they survived long, cold winters without fresh produce. To learn how to easily peel and cube a butternut squash, check out this post: All About Butternut Squash – How to Peel, Seed and Prep. If you need some guidance on prepping the chickpeas, here’s a primer: How to Soak and Cook Chickpeas. You can use canned chickpeas if you’re running short on time – just make sure they’re additive free. This recipe is completely unprocessed, seasonal, vegan, and super simple to make. It’s perfect for a chilly autumn afternoon; the soup will fill your house with a warm and spicy aroma. 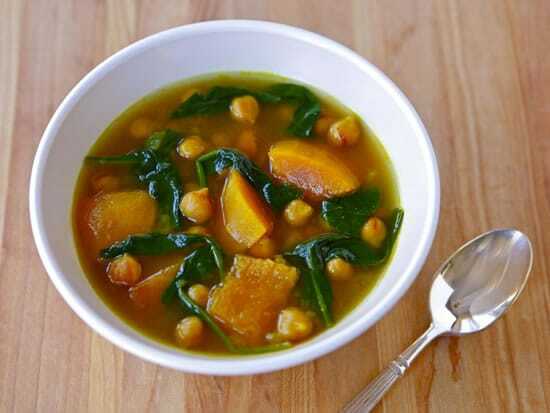 The natural sweetness of the squash really compliments the nutty flavor of the chickpeas. It’s low in calories, full of fiber, loaded with flavor and gluten-free. Healthy comfort food that gives you an inner glow… what could be better? This recipe is completely unprocessed, seasonal, vegan, and super simple to make. It’s perfect for a chilly autumn afternoon; the soup will fill your house with a warm and spicy aroma. In a large pot, heat up olive oil over medium. Add the onion and sauté for about 10 minutes till softened. Add the butternut squash and cooked chickpeas to the pot. Cover with 2 quarts (8 cups) of hot water. Bring to a boil, then reduce to a simmer. Stir in the cumin, turmeric, cinnamon, cayenne, and 1/2 tsp of salt. Cover the pot, lid slightly vented. Let the soup cook for 20-25 minutes till the squash is tender. Take the lid off and stir in the fresh spinach leaves. Continue to let the soup simmer for 1-2 minutes till softened and wilted. Remove from heat. Season with additional salt to taste, if desired. Serve hot. May be served over steamed brown rice for a more filling entrée. Tori Avey is a food writer, recipe developer, and the creator of the popular cooking ad lifestyle blog ToriAvey.com She explores the story behind the food– why we eat what we eat, how the foods of different cultures have evolved, and how yesterday’s food can inspire us in the kitchen today. Tori is a regular contributor to several major culinary websites, including a popular column called The History Kitchen that she writes for PBS Food. You can also follow Tori on Facebook or Twitter. It’s OK. Limiting candy won’t ruin childhood. Great post, and thanks for the recipe. I look forward to making it. Just a quick note of advice from a biologist: whenever you wish to give the scientific name of any species of organism, you can abbreviate the genus with the first initial only after it’s been spelled out in full first. The various varieties of winter squash you mention are therefore Cucurbita moschata (italicized when formatting makes it possible).Then if you want, after that you can mention C. mixta, C. maxima, and others. This is on my must-make list. It looks super light and delicious. Made this delicious soup today. So easy. And the aroma was delightful. because that was what I had on hand.) Try it! So glad you liked it Mary Lynne! Baby kale is a great sub. Thanks for writing! Wow. WOW. I love this soup. I just had my first bowl moments ago. Smells delicious while it is cooking and tastes great. I think I will boil up some farro to mix in when I want something a bit more filling, make it a dinner. Seriously. Make this soup. You won’t be disappointed. Hi, I was wondering how the cumin should be added – do you grind it up or add it whole? thanks. Hi Lisa, you should use ground cumin. Enjoy the soup!